I've been thinking for a while about making devilled eggs since I spotted this feature in Saveur. You forget how delicious dishes like this are if they're freshly made. With a few crunchy Little Gem lettuce leaves they make a nice light summery lunch. Or even, if you dare, a retro dinner-party starter. 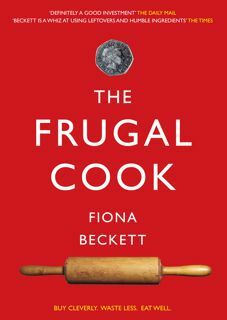 Bring a small saucepan of water to the boil and carefully lower in the eggs. Bring back to the boil and simmer for 10 minutes then drain the eggs and run cold water over them. Leave until cool enough to handle. Meanwhile separate the lettuce leaves and wash in cold water. Drain and dry. Crack the eggs lightly and carefully peel off the shell. Cut the eggs in half lengthways and ease the yolks into a bowl. Mash them and add the mayonnaise then season with a little curry powder or paste, a few drops of Worcestershire sauce and Tabasco or cayenne pepper and a little salt. Mix in the chopped chives. There are a number of different ways of doing this depending on what you have to hand. Anything fishy works well with eggs so you could mix the yolks with a little anchovy paste, crab paté, mashed sardines or tuna or that Scandi-style salmon paste in a tube. (If you wanted to jazz it up you could top the eggs with a bit of salmon roe.) Or you could mix in some finely chopped ham and spike it up with a bit of English mustard. Good party eating too. Would you eat devilled eggs or would you feel embarrassed to serve them. What retro recipes (if any) do you make? Recently, I did do two "retrodishes": seven layer salad (chopped lettuce, chopped celery, frozen peas, thinly sliced onion, sliced hard-cooked egg, diced bacon, grated sharp cheddar, Miraclewhip salad dressing mixed with a bit of sugar; layer the ingredients, then spread the dressing over the top. Refrigerate until ready to serve and it tastes even better the next day. Then I did a pineapple cream cake. Yellow cake, baked in a 13 x 9 pan. Let it cool a bit out of the oven, then poke holes all over the top. Pour a can of crushed pineapple, juice and all, over the top. Then spread vanilla pudding over that, topped of with a carton of Cool Whip spread over all. Refrigerate for several hours, and this, too, is better the next day. It is the only thing I allow Cool Whip into the the house for - tried whipping cream, but it didn't work at all. 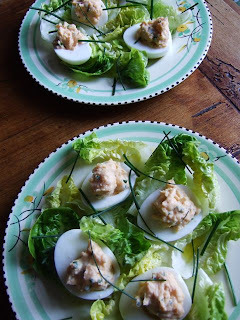 I've never made devilled eggs, although these do look good, and I often make egg mayonnaise sarnies for my son, but I have made prawn cocktail recently. From scratch, natch. No cocktail sauce out of a bottle for me. Bet you Granny didnt drizzle Olive oil over the lettuce. My grandmother kept a teensy bottle in the medicine cabinet!! Yet we grew olives in a 100 ha orchard on the farm! I make cheg which is similar except that the egg is mixed with grated cheese and mayo with seasonings. It's a favourite. Once I used tuna instead of cheese and that was tasty too. Good to see so many devilled egg enthusiasts. No my Granny didn't drizzle olive oil over the lettuce Michael. Nobody drizzled anything in those days. Like the idea of layered salads and proper prawn cocktail too. And sausage rolls - now that's a golden oldie that's never gone out of fashion. I love deviled eggs...love the idea of adding curry. I usually sprinkle them with cumin instead of paprika. 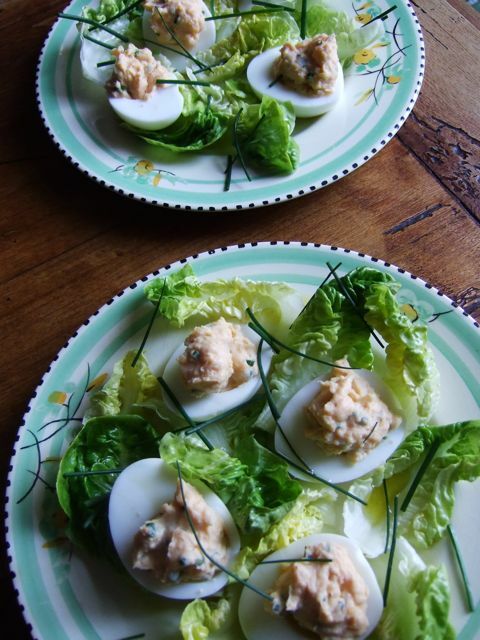 Love the idea of devilled eggs... But my favourite has to be prawn cocktail. It's a classic served with buttered brown bread. If I'm feeling extravagant, I also add smoked salmon trimmings as well.